I Know HE's the Boss ... But, Dinghy's Ridiculous!!! Double Date w/ Tom Hanks ... BUT WHO PAID?! Bruce Springsteen -- Double Date with Tom Hanks ... BUT WHO PAID?! 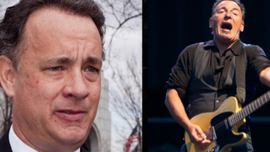 Bruce Springsteen Parties with Tom Hanks!